This wonderful composition features the waning crescent Moon as a centerpiece for the ancient Poseidon Temple at Sounion, Greece. 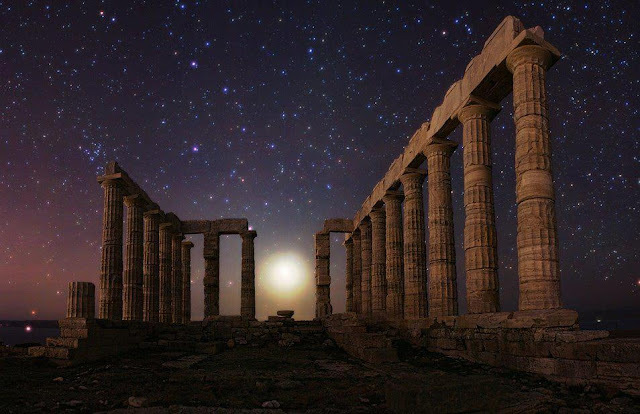 The handsome temple was built in approximately 440 BC. Note that the Moon appears more gibbous than crescent because time exposure was used to enhance the background stars. Lustrous Saturn reclines atop the Doric marble column to the upper left of the Moon. The cluster of stars just to the upper left of the left-most complete column is the Coma Cluster, in the constellation of Coma Bernices. The picture was selected as Picture of the Year 2009 at EPOD (Earth Science Picture of the Day).